The continuous price hike of automobiles in Pakistan is a serious issue and it is important to write down the facts about it. While the country is trapped in a situation of hyper inflation, how come the car manufacturers lag behind? So they have also raised the prices of their vehicles at the start of the current this month of April. The prices have been increased continuously for the 3rd time during the last few months. Secretary of Petroleum and Natural Resources, Muhammad Ejaz Chaudhry was addressing the parliamentary committee on oil prices, where he revealed that petroleum prices will see a major hike in few days and said that keeping in concern the global prices of gasoline, government will have to raise the rates accordingly. A chair person, Rana Tanveer said that the government makes them fool every time and the prices are continuously going up and he also walked out in protest against the upcoming price hike. Then the Finance Minister Hafeez Sheikh took the committee into confidence over the decision. The Senior General Manager Sales and Marketing of Indus Motor Company “Ali Asghar Jamali” said that the current hike was essential due to the depreciation of Pakistani Rupee against the Japanese Yen by 5% (from 1.0980 to 1.152) and American Dollar by 4% (from 86 to 89). He also narrated that current situation forced Indus Motor Company (IMC) to increase up to 1.5% on the prices of Corolla, Cuore and Hilux. The automobile manufacturers pointed out that increase in the energy cost and the sudden increase in the prices of petroleum up to 4.7% to 5% and also the increase in utility prices, have affected the manufacturing cost. The prices of petroleum are further increasing continuously. They also mentioned that the prices of raw materials, including plastic, paints and light engineering products, had also showed an unexpected increase. The transportation cost of the raw materials was also affected by the hike in petroleum prices. Another reason was the expensive diesel used for power generation in absence of electricity and natural gas. 3% increase in electricity tariff during past couple of months was also an addition to the price hike of cars. The automobile makers also said that they borne the increase mostly on their own through localization, otherwise the cost would have increased more on different brands of cars. Hence almost all car manufacturers intentioned to put some of the impact of price hike on the customers. Although the automobile manufacturers objected that every time the prices of cars go up, they have to face public outrage right away. IMC increased its rates of 7 models, pricier by Rs. 25,000 to Rs. 50,000. Prices of Corolla variants have increased by Rs. 20,000, Altis variants prices have increased by Rs. 30,000, whereas the price of Cuore has been increased by Rs. 15,000. The new price will be Rs. 14,44,000 for XLI, Rs. 15,74,000 for GLI, Rs. 18,79,000 for Altis AT, Rs. 17,89,000 for Altis MT and Rs. 24,89,000 for Hilux 4×4 Std. 850cc Cuore CL STD will now cost Rs847200 and CNG fitted Cuore CX ECO-CNG pricier by Rs. 32,200 will cost Rs. 8,97,200. The Toyota GLI Ecotec and Automatic Transmission model are both pricier by Rs. 33,500 and will cost now Rs. 17,32,500 and Rs. 17,72,500 respectively according to the new rates. 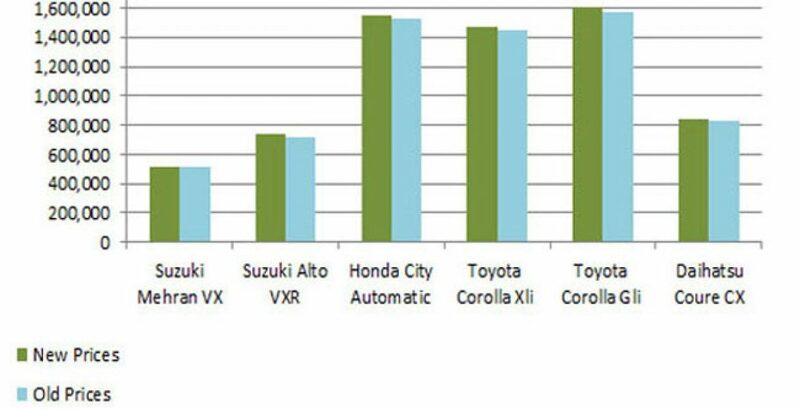 The Toyota XLI Ecotec gets the highest increase in price and will cost now Rs. 16,02,500 pricier by Rs. 53,500. The price of Hilux has been already increased pricier by Rs. 50,000 in the last December. One of the largest car assemblers in Pakistan, Honda Atlas Cars Pakistan Limited (HACPL) has raised the prices of different models of cars by Rs. 20,000 to Rs. 30,000 for the year 2012. The prices of Honda car models are situated as Civic VTi Oriel prosmatec transmission on Rs. 20,48,000, Civic VTi Oriel manual transmission on Rs. 19,70,000, City 1.3L Automatic on Rs. 15,50,000 and City 1.3L manual transmission on Rs. 14,09,000. Suzuki car manufacturers added Rs. 11,000 to Rs. 20,000 in their prices. The prices of Suzuki have gone up in order as Mehran Rs. 5,16,000 pricier by Rs. 11,000, Alto Rs. 7,20,000 pricier by Rs. 15,000, Cultus Rs. 9,06,000 pricier by Rs. 15,000 and Swift Rs. 10,78,000 pricier by Rs. 20,000. The government of Pakistan is not taking a single step forward to solve this issue. The government even has banned importing of the imported cars in collaboration (under the table) with the local car manufacturing industry.